I’ve been wanting to try arm knitting for such a long time but I was afraid of starting and not being able to finish it. Could you imagine? Stuck with a tonne of fabric on my arms and nowhere to put it. Maybe this wouldn’t happen with a scarf but if I was to arm knit a blanket, it for sure would! With that said, today I bring you a DIY Hand Knitted Scarf tutorial. I love this switch up from the original arm knitting as you can do a little bit at a time. What’s even better is that you only need a few items to get started on this knitted scarf. The first and only thing you will need is fabric. I picked up this chunky bundle from a local craft store as they had a ton of it and in a variety of different colours. 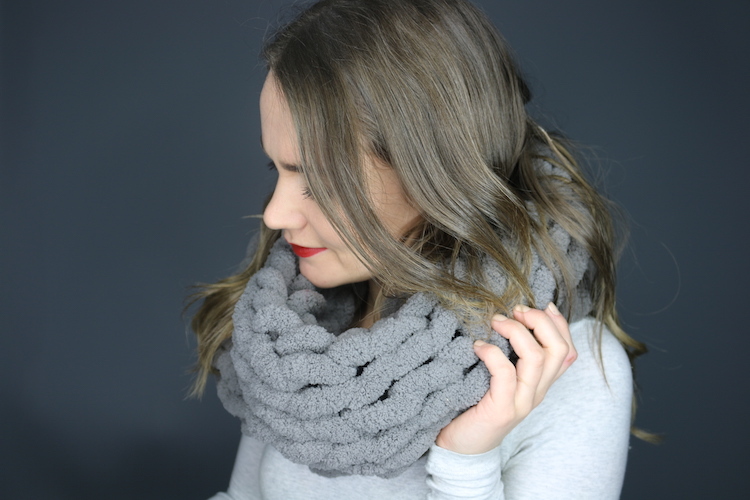 Check out the video below for a full tutorial on how you can create this scarf!